Munich has some amazing museums and guided tours in the top attractions. However, what about those who want to experience what the outdoors has to offer? Look no further. At CeleBreak we love being active and spending our time in the outdoors, especially playing football. When we are not at the pitch, we are out seeing what adventures await us. As a result, we created this list which of the best outdoor activities in Munich consisting of some unusual ones you may not have thought of doing. 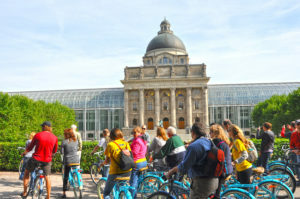 Ranked as the #1 sightseeing tour in Munich on tripadvisor.com, Mike’s Bike Tours is something you must do if you are in Munich. Taking a bike tour is a great way to see the city and view the beautiful sites of Munich. Many of the tours last around 3 hours and are extremely relaxing and enjoyable. Besides just bike tours, they offer other kinds of tours on their website. To list a few, there are walking tours, private car and bus tours, and even bike rental options. To see all they offer, check out there website to experience some of the best outdoor activities in Munich. How many times can you say you surfed in a river? Let alone in the middle of the city? With this man made Eisbach River, you now can. It is located in the city that flows through English Garden and connects to the Isar River. River surfing has become the new popular activity in Munich as a hobby, tourist attraction, and for those who want to learn. The main wave for experienced surfers is a meter high that doesn’t cease, meaning you can ride for as long as you want. The easier waves are downstream for the beginnings or for those who are new to surfing. If you rather just watch the surfers do their thing then go on ahead! It’s very common to do so, for instance tour buses even stop here so people can watch. Enjoy the sunlight, greenery, and views of the city in the The English Garden. The garden runs from the city center to the northeastern parts of Munich which covers roughly 1.4 square miles, (3.6 square kilometers). With that being said, this makes it one of the largest urban parks in the world. You can also enjoy many leisure activities in or around the The Isar River which runs through the garden. You can raft, swim, sunbath or surf, as mentioned above with the Eisbach River Wave. There is even has a massive beer garden, a 78 kilometer- long (48.5 miles) network of paths, and fields where amateur soccer players recreational games. There is also a Japanese Tea House, located on the southern part of the park that holds Japanese tea ceremonies regularly. All in all, you could spend a whole day here with how much there is to see and the amount of relaxation this park offers. Anyone can walk through and enjoy the presence of an Olympic Stadium, but how many can say they climbed or zip lined across it? The stadium was built in 1972 and is located in the Olympic Park Munich complex. The zip line is called the flying fox and the only way to get there is by climbing the stadium to get to the platform. Once you make it, you will be able to ride the 200 meter long 40 meter high zip line. If you rather just climb the stadium then they offer that option as well. The tour guide will take you and a small group on a 120 minute climbing adventure. 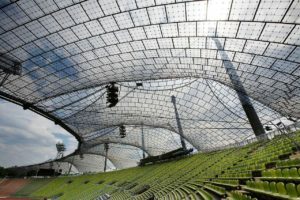 You will have the chance to see fantastic views of the the Munich skyline, the Bavarian Alps, as well as learning about the architecture and construction of the stadium. For some more sightseeing, explore the rest of the park which includes a lake, a hall, swimming pool, and the Olympic Tower which has a viewing platform 190 meters high. If you want outdoor activities, then definitely try this. Munich is known for its beer right? It is also known for its amazing city tours. So put them both together with a Beer Bike Tour like Lenny’s. 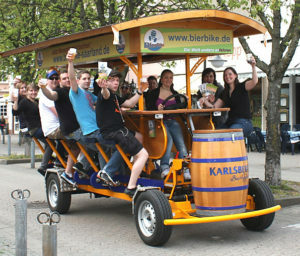 Help the driver (who is sober) pedal through the city sites while you take sips of beer. The driver is the only one steering so your hands are free to drink as much as you want. Definitely take advantage of this traveling beer garden and make sure to call a cab once you are done! Enter the city gates and get a true feel of Munich by taking a walk through the Old Town. The walk in total is 2.5 miles with many historic landmarks along the way like Frauenkirche and St Peter’s Church. You could do a guided tour or walk it yourself. You can enjoy the amazing atmospheres and view the famous Hofbräuhaus beer hall. For a free walking guide click here. This may not be exactly your typical outdoor activity but if you are in Munich then experiencing Springfest or Oktoberfest is a must! People from all across the continent come to celebrate spring or fall in the best way possible. Enjoy various food, music, fairs, fireworks, and of course, lots and lots of beer. First, if you are here in the beginning of the year you get to enjoy Oktoberfest, the world’s largest Volkfest. 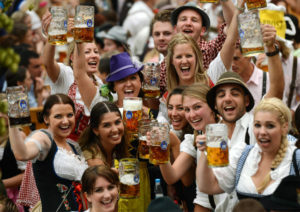 From September to October, more than 6 million people from all the around the world come to visit and drink beer. For the warmer months you have Springfest, the little sister of Oktoberfest. Many seem to enjoy Spingfest a little more because warmer spring weather and smaller crowds. They also over a Spingfest camping package for a few days so check that out as well. You do have to buy tickets for both but they are worldly well known festivals so you are guaranteed an amazing time. You already love being outside, why not play some football ? 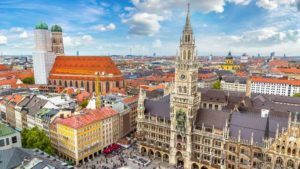 Are you trying to find out what to do in Munich? 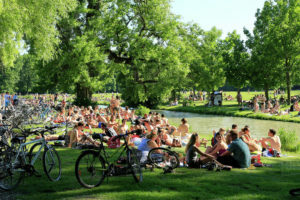 Add CeleBreak to your list of outdoor activities in Munich! We organise pickup football games at times that work best for you, available to anyone. We offer games at different times throughout the day allowing you to fit in games based on your personal schedule. It is super easy to get started. Download the app, pick your location, pick a time that works for you and join a team.